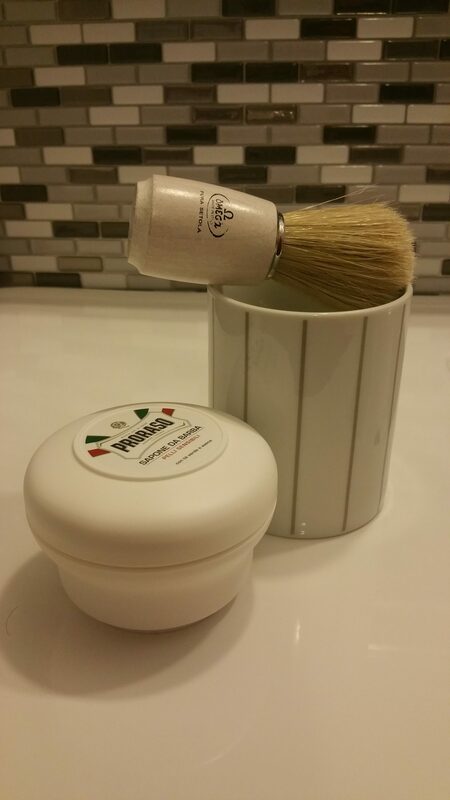 Proraso is an Italian shaving company that focuses on: soaps, foams and after shave products. They don’t offer razors for example. In this review we will touch on the sensitive shaving (white) foam as well as the shea butter foam (red). Proraso offers a simple 3 color collection of products. Red, White and Green – Viva Italia! You can see for yourself the family pride in producing these products. The red collection offers a very rich, tick and comfortable shave experience. They market it to the man needing a bit more to achieve a comfortable shave. The white collection is their “sensitive” line. The green collection is their eucalyptus and menthol line. This certainly makes the shave a whole lot more refreshing…and pleasant. I have been using the white foam for some months and find it to be a top level foam. It’s thick, covers well, offers full protection and glides and rinses off very easily. The fact that it is readily available in most “Shoppers Drug Mart” and decently priced makes it a favorite. The red foam on the other hand is NOT that easy to find. Lately, I was finding that the white foam wasn’t offering enough lube and my face felt a tad under-protected. 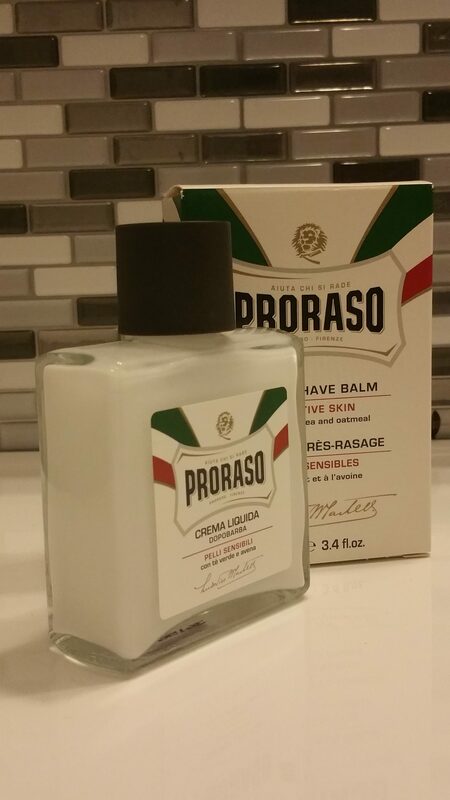 I read about the “red” option on the Proraso site and set out to find myself a bottle. The only place I could get a hold of it was at MenEssentials. But at that time Canada Post was considering going on strike. Then out of nowhere my Italian friend sent me a text with a picture of the shaving product section of the Italian grocery store in the Byward Market in Ottawa; La Bottega – Nicastro. And surprise-surprise, they had the red foam bottle for $9. I picked one up the next day and was not disappointed. All of the quality of the white formula, but with more lube and what felt like a ticker foam. The fragrance was also quite lovely: Sandalwood. As for the green collection, I have only tried the tube version of their shaving cream. This version of the product is somewhat more concentrated and you will need very little to get a good coverage. I will warn you that the tube cream is not as smooth as foam and a bit more rubbing is needed to soften it out. The green version is intense and refreshing. I liked it as is woke my face – perfect for the morning routine. The tube solution will also last you a very long time. In the range of 6-8 weeks of daily shaving. I have also tried their soap in a dish solution in white. It was fun to work with a brush, but soap as a whole does not offer the kind of comfort and protection I have grown accustom to with their luxurious foam solutions. If you like using a soap – then this is certainly a good option as it lathered well and was in a convenient dish with a lid. Lastly, I just tried their sensitive after shave lotion this morning. It comes in an proper glass bottle. Nothing fancy, but just right. The lotion is fairly liquid and thus covers very easily. It is not thick like after-shave creams. it is truly a “lotion”. It is certainly a nice and smooth alternative to creams. As it is in the “Sensitive” line, there is very little fragrance and the lotion itself is quite delicate. I liked it and at first I was mostly using it on days where I needed a tad less repairing in my post-shave. Fast forward to today, it has more or less become my go-to after shave solution. 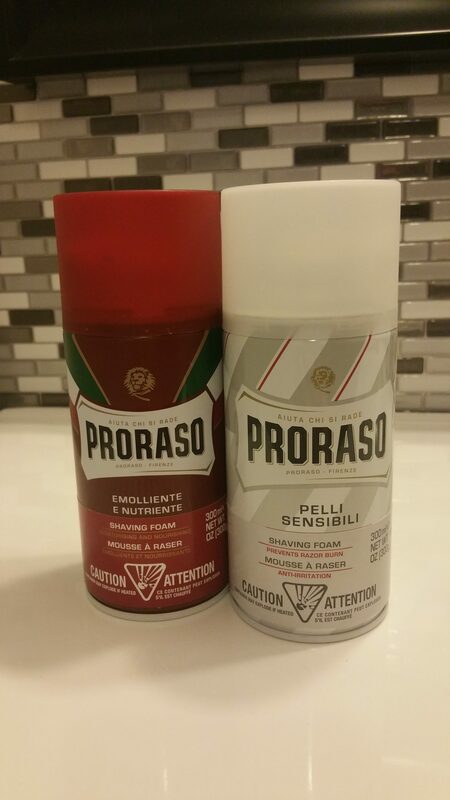 This Proraso product is not necessarily found everywhere. My bottle was purchased at “La Botega – Nicastro’s” in Ottawa. You can also find it on-line.